I attended the Fancy Food Show in San Francisco in January and I was delighted with the offerings from local companies near UC Davis. Since I attended this vast international exhibit, I have purchased several local products that I discovered at the show. The exhibit was so large, I was only able to see half of it in a day. I met Matthieu Kohlmeyer, the French CEO and General Manager of La Tourangelle, whose walnut oils are processed 15 minutes away in Woodland. I was also impressed with Mezzetta pasta sauces from Napa. I have purchased their olives and fire-roasted peppers for years, so why did I fail to notice their pasta sauce among the endless brands on the shelves? Unfortunately, my favorite in their line, Puttanesca, was not on the shelf at my grocer, but I found the spicy Arrabbiata, my second favorite tasting at the show. As I looked for the locals I looked in vain for a local grape seed oil. The Italians were selling grape seed oil at wholesale prices that were surprisingly low. Meanwhile, I knew that grape seeds in our nearby wine regions are still largely treated as waste, just as UC Davis olives were treated before our former grounds manager Sal Genito partnered with a local olive oil company to launch a gourmet brand of oil at UC Davis. To my delight, Sacramento Bee Food & Wine writer Chris Macias featured WholeVine grape seed oil on the March 14 food page. Its parent company is a successful local start-up, SonomaCeuticals, Santa Rosa, who developed the process to extract the oil from local grapes. Not surprisingly, UC Davis was involved. 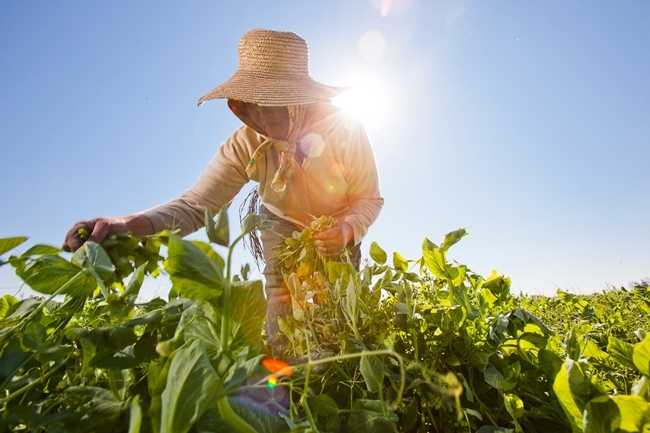 Sharon Shoemaker, director of the UC Davis' California Institute of Food and Agricultural Research (CIFAR), was interviewed about her role in helping SonomaCeuticals tap into campus expertise. 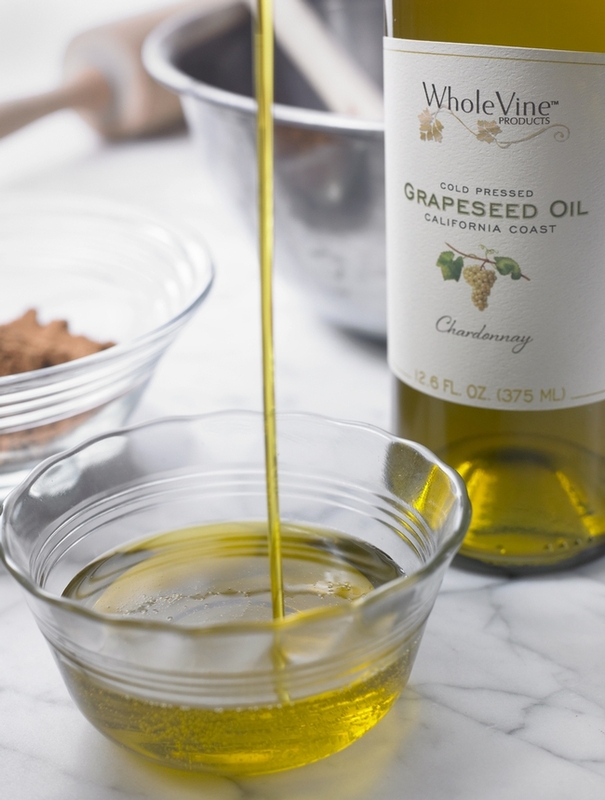 WholeVine grape seed oil is cold pressed, allowing it to retain the natural flavors of chardonnay, zinfandel, reisling and other winegrape seeds. The flavor provides an added bonus to a naturally high smoke point and health benefits. This commands a higher price than imported oils and allows the firm to compete in this market. Shoemaker and her program CIFAR (see-far) are champions of campus research. Since 1992, her dynamic energy has been sustained through private enterprises that pay for her business-friendly conferences and services to benefit small and large concerns. Rarely does the public see how often executives drop in to tap into UC Davis resources. This happens behind the scenes with little fanfare, except this time, when the nuances of a new product triumph came to light on the food page. All of us can now enjoy the benefits. August visitors to California wine country can see winegrapes ripening – green changing to gold, red and purple. This is the critical final stage of development, and its success drives one of the state's economic engines, with wine sales generating $18 billion in revenue in 2009. Wine country is also a tourist magnet and a job generator; the industry has a $61.5 billion economic impact statewide each year. However, in recent years growers have become increasingly concerned about a malady that appears during this phase. Known as “berry shrivel,” this disorder leads to shriveling of berries on a cluster. There are several kinds of berry shrivel. 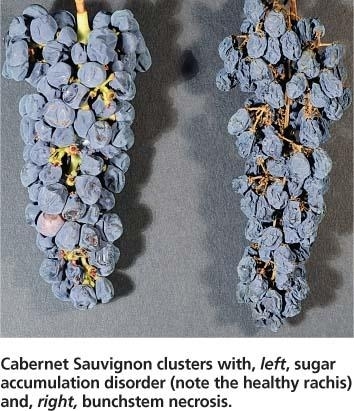 Of greatest concern to growers and winemakers are sugar accumulation disorder (SAD), in which grapes turn flabby and lack sugar, and bunchstem necrosis, (BSN) in which grapes turn raisin-like on the vine, losing juice and often developing undesirably high sugar content. (See California Agriculture) Either of these disorders makes the fruit less desirable for winemaking, with yield and production losses. Berry shrivel afflicts both red and white varieties. Cabernet Sauvignon and Merlot are the major red varieties to be affected so far. Among the white varieties, Sauvignon Blanc, Chardonnay, Semillon and Riesling have shown symptoms. The malady usually becomes apparent when winemakers or sugar samplers are in the vineyard tasting fruit. 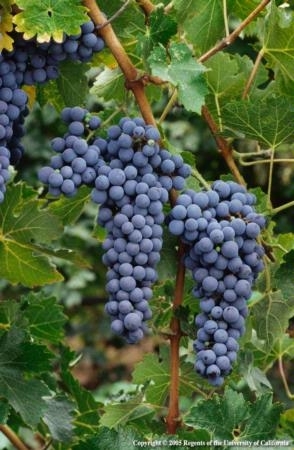 Once detected, vintners will often make a pass through the vineyard just ahead of the harvest crew to drop this fruit due to its low sugar content and off-flavored juice. "Berry shrivel usually affects a small proportion of a vineyard's fruit – perhaps 5 percent -- but in particular vineyards and years, shriveling can affect more than half of the crop," says Mark Krasnow, who was a postdoctoral student at UC Davis and is now at the Eastern Institute of Technology in Hawke’s Bay, New Zealand. "In some years and some sites, wineries will decide not to harvest a vineyard due to the amount of shrivel. Fortunately this is rare." The origins of SAD and BSN are a mystery, in spite of research investigations. Krasnow and his colleagues at UC ran a battery of high-tech tests to determine the factors involved, but found little consistency in results and to date, all tests for pathogenic organisms have been negative. Whether due to SAD or BSN — berry shrivel occurs in vineyards all over the world, managed under different climates, making it a globally significant problem in winemaking. "The irregularity of when and where (or if) SAD and BSN occur makes them very difficult to study," Krasner notes. 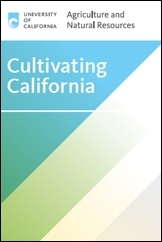 Tests conducted by UC Davis Foundation Plant Services were negative for phytoplasmas, closteroviruses (leafroll), fanleaf viruses, nepoviruses and fleck complex viruses. Preliminary studies suggest that SAD can be propagated by chip budding, but vine-to-vine spread has not been seen, according to Krasnow. Future studies will focus on tests for a causal organism and a more careful examination of the metabolism of fruit affected by this disorder. Bunchstem necrosis also varies in symptoms and whether effects occur on clusters or whole vines, and can occur at bloom or at ripening (veraison). Future studies will examine varietal differences in susceptibility having to do with xylem structure, the importance of concentrations of mineral nutrients, and other cultural factors.